The Monroe Street city project has inspired a lawsuit from some of the road's business owners. Even now, the group of Monroe Street businesses haven't given up trying to stop the LANE REDUCTION on the 1.12-mile stretch of North Monroe Street between Kiernan and Indiana avenues. 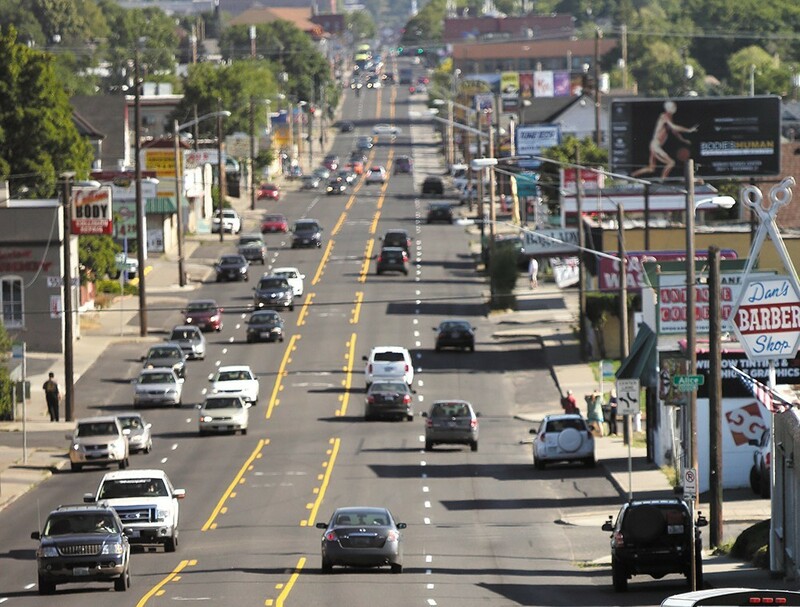 The "Monroe Street Business Association" — a group formed to oppose the project — sent a letter to Mayor David Condon claiming they had been "recipients of intentionally misrepresented, contradictory, deceitfully camouflaged, arrogantly vague, and fraudulently misdirected misinformation" about the lane reduction. The letter is signed by 24 Monroe businesses, including Skipper's Restaurant, Azar's Restaurant, All American Tattoo, Spokane Vacuum Cleaner, Fred's Appliance and the Aloha Island Grill. Additionally, they hired attorney Bob Dunn to file a $15 million tort claim against the city. Dunn not only names the city officials as liable parties in his tort claim, he names Emerson-Garfield Neighborhood Council members as well. Dunn argues that what the public was told about the project originally has changed. Originally, he claims, the businesses were told the project would last two years, and would only disrupt a handful of businesses at a time. Now, it's being discussed as an eight-month project, where two four-block segments of the street would be shut down at a time. "If they want to be transparent, they ought to be back to the drawing board," Dunn says. But city spokeswoman Marlene Feist says that the construction strategy was only finalized this month. It uses two different contractors to get the construction done as fast as possible, precisely because the city wanted to limit the damage done to local businesses. This timetable doesn't appear to be new: July 2016 Monroe Street Planning meeting minutes show that the city was planning on a tentative nine-month construction schedule. In the latest blow to what would be the largest COAL TERMINAL in North America, the Washington State Department of Ecology on Tuesday denied a needed water quality permit to Millennium Bulk Terminals. Environmental groups and Ecology viewed the decision as essentially killing the project, which is one of the only major fossil fuel export operations still proposed for the state. However, the company has 30 days to appeal the decision. The Longview terminal, more than five years into the permitting process, would ship up to 44 million metric tons of coal to Asia each year, and create 230 direct and indirect jobs at first, with 300 ongoing jobs at full buildout, according to the company. That coal would pass through Spokane on its way from Wyoming to the port in Western Washington, with eight loaded trains headed west and eight empty trains returning to the Powder River Basin every day. The permit that Ecology denied Tuesday was needed under the federal Clean Water Act before the company could dredge more than 40 acres of the Columbia riverbed, fill 24 acres of wetland, and install a new trestle and docks. In a statement, Ecology said the permit was denied because the terminal "would have caused significant and unavoidable harm to nine environmental areas: air quality, vehicle traffic, vessel traffic, rail capacity, rail safety, noise pollution, social and community resources, cultural resources, and tribal resources." State education leaders are proposing changes to STUDENT DISCIPLINE that would limit how and when certain students can be suspended or expelled. For years, Washington schools have tried to reform student discipline, as students of color and special education students are kicked out of school more than other students. But the effort to reduce exclusionary discipline has clashed with teachers who say classrooms have become unsafe. Now, state education leaders are proposing new rules to make the discipline process fairer for all schools. Under the proposed revisions, school districts would be prohibited from expelling any student in a grade lower than fifth grade, except for firearm violations. No child can be suspended for being late or missing class. And when a student is suspended, schools must work with a student's family to help a student return to school. Vanessa Hernandez, American Civil Liberties Union of Washington education equity director, says she appreciates that the rules would focus on increasing parental engagement in addressing discipline issues. But she says they still allow for short-term suspension of the youngest students, and she would like to see that changed. Spokane Public Schools spokesman Kevin Morrison says the district is studying the proposed revisions to the policy, like every other district. Spokane, he points out, already has some policies in place that match the revised rules. For example, Spokane already collaborates with parents of suspended or expelled students and develops re-engagement plans. And some restrictions on when to discipline kids in kindergarten through fourth grade were already in place.